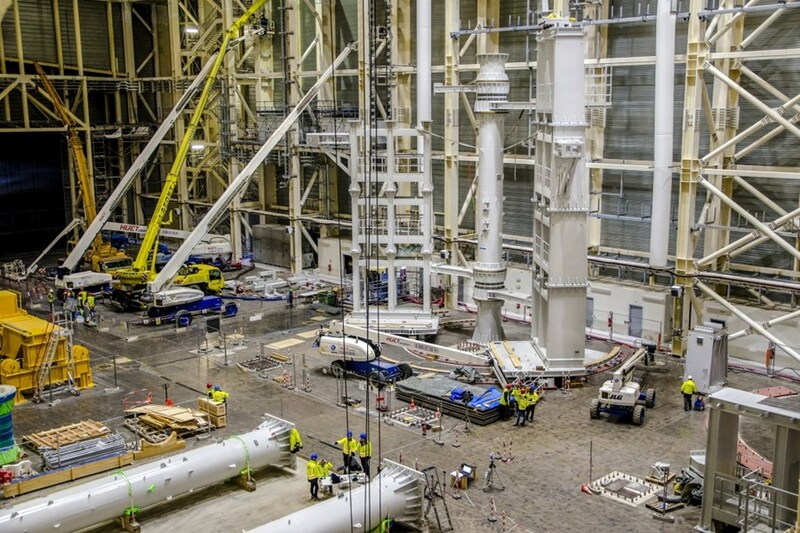 Good progress on the installation of the first of two specialized tools for vacuum vessel pre-assembly means that by late June, the 22-metre-tall giant will be ready for functional testing. Although similar in colour to the building structure, the first sector sub-assembly tool is a striking new presence in the Assembly Hall—22 metres tall and built from 800 tonnes of metal. In the foreground are the two outboard columns that will be installed this month. Side-by-side in the Assembly Hall, the largest bespoke tools in the project's assembly toolkit will be active for approximately three years—from 2019 to 2021—smoothly opening and closing their lateral wings (millimetre by millimetre) to associate thermal shielding and a pair of toroidal field coils to each of the nine vacuum vessel sectors before their transfer to the Tokamak Pit for welding. The three-footed tools will support the 440-tonne sectors vertically, as the components are positioned and aligned to millimetre-level assembly tolerances. Each unit—built from 800 tonnes of metal plus auxiliary components—is designed to support nearly 1,200 tonnes of dead weight. A sophisticated system of actuators on the lower platforms will allow operators to control alignment to within one millimetre. A dummy load of 340 tonnes will be tested on the equipment early next year. The first tool, delivered to ITER in batches last year by the Korean Domestic Agency, is now nearly completely assembled, with all key components for the rails, rotating frames, rotating arms and inboard column in place. By the end of April the remaining equipment—lower alignment units and two outboard columns—will have been installed. Functional tests are planned in June. 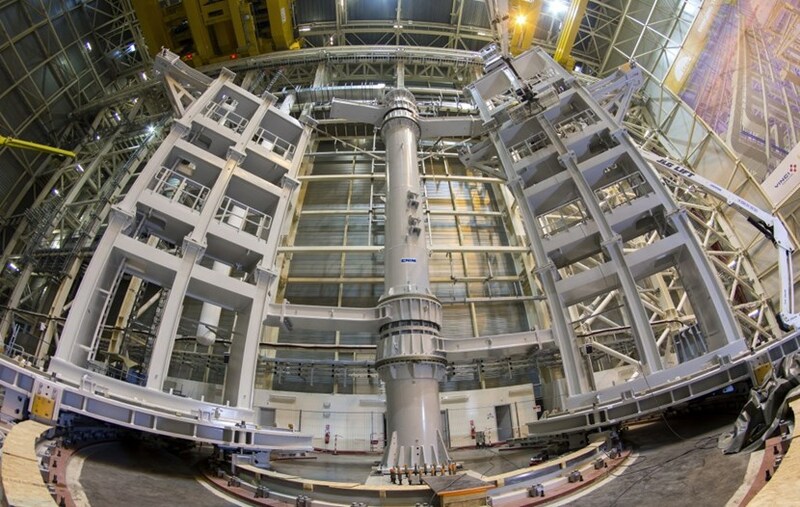 The same month, the second sector sub-assembly tool—which completed factory acceptance tests at Taekyung Heavy Industries in Korea in March—will be delivered to ITER for assembly. By next February, both tools will be ready for the final test before entering operation—verification with a full-weight dummy load of 340 tonnes, or the weight of one toroidal field coil plus a 10 percent safety margin. This final qualification activity will allow operators to verify the tools' ability to accurately adjust the dummy load toroidally and to six degrees of freedom* within tolerances of +/- 1 millimetre. *Six degrees of freedom refers to adjustability along X, Y and Z axes (up and down, side to side, forward and backward) as well as in rotational directions relative to the axes (swivel, tilt, pivot).